This recipe was inspired by the velouté with diced vegetables which I had The Kitchin in Edinburgh. 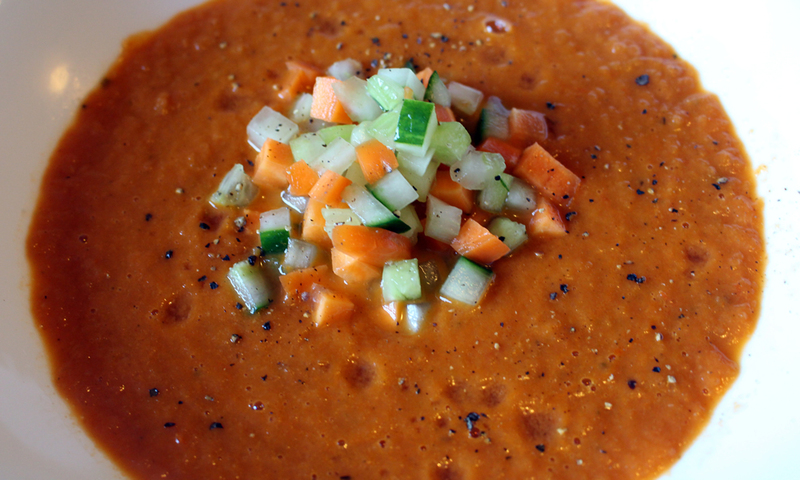 I really liked the simplicity of the small diced vegetables and thought it would work well with a refreshing gazpacho soup. Brunoise is a kind of a “posh” cutting technique when you dice something up to create a cube no bigger than 3mm on each side (In france the cube is usually smaller 1-2mm called a fine Brunoise). As you can see from the picture above, it’s tricky and unlikely you’ll get all perfect cubes but unless you’re cooking in a Michelin starred restaurant then no one should notice. It’s a perfect dish for Summer and makes either a great starter for 4 people or a main course for 2. Pre-heat the oven to 200c. 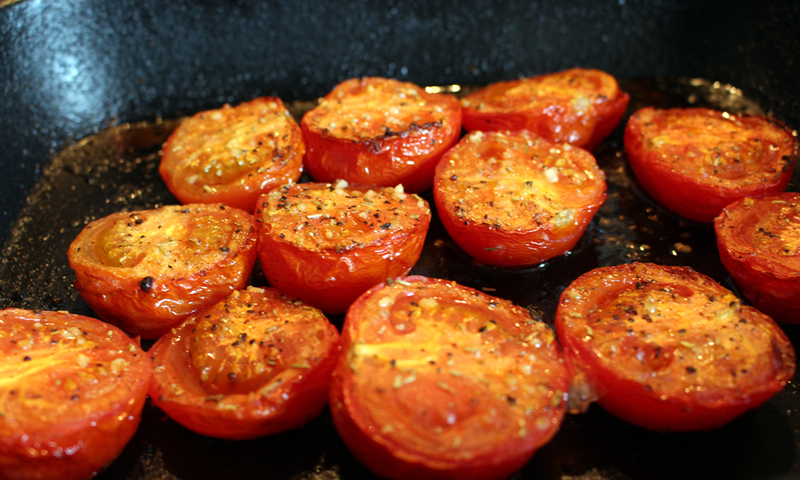 Cut the tomatoes in half and place on a baking tray, drizzle with olive oil, salt and pepper and put into the oven. After 30-40 minutes the tomatoes should look like the image below. Leave to cool a little. Meanwhile finely chop half an onion, the 2 garlic cloves and the anchovies. Add the onion to a large heavy based saucepan with the knob of butter. Gently cook on a medium heat until they become translucent. Then add the garlic and give it a quick stir. The tomatoes should be reasonalby cool to handle now so you can peel the skins off the flesh with your hands. You don’t have to get all the skin off but try and get most of it. Discard the skin and add the tomates along with the juice from the baking tray to the onions and garlic. Mush up the tomatoes as much as you can and add the chopped anchovy fillets. Cook for about 3 minutes, stirring constantly. Add the stock and simmer for 30-40, the soup should thicken slightly. After the soup has thickened remove from the heat and leave to cool. While the soup is cooling chop up the cucumber, carrot and celery as carefully as you can to make equal sized cubes (about 3mm cubed). Set the vegtables aside in a dish and squeeze the juice of half a lemon over them. Once the soup has cooled use a liquidiser or hand blender to liquidise it. For a really silky texture pass through a fine sieve making sure you get all of the juices and goodness out of the pulp that forms in the sieve. Season to taste with the Worcester sauce, tabasco, salt and pepper. As the soup is going to be served chilled it is better to slightly over season it. Put the soup and the brunoise vegetables in the fridge for at least and hour before serving. When fully chilled ladle the soup into bowls and carefully spoon the vegetables into the middle of the soup. Add a squeeze of lemon juice and a couple more drops of tabasco before serving.